Oh no! not another history lesson? Continuing southward after that mind-numbing stop at the nation’s capital, we drove less than 200 miles and parked Betsy in Williamsburg, VA. One of our rules is to try not to drive more than 200 miles to our next destination (the only exception was when we were in Alaska). Following that rule, we will have a sloooow southward migration to Florida, making several stops before we finally vegetate for the winter (haven’t done that yet!). 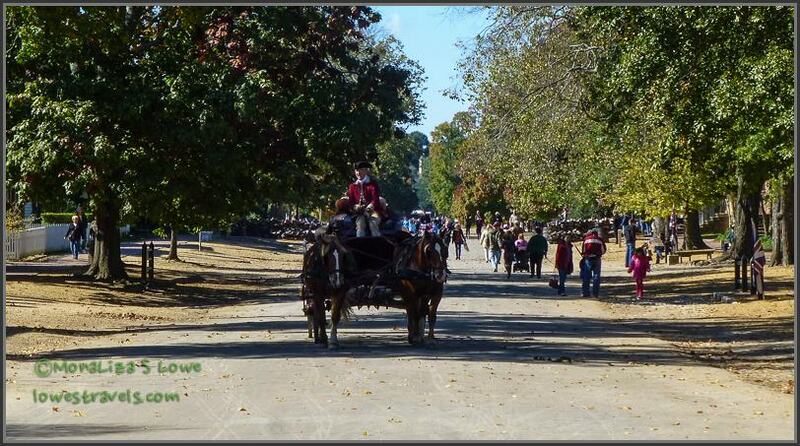 After getting Betsy parked and set up, our first visit was to Colonial Williamsburg. 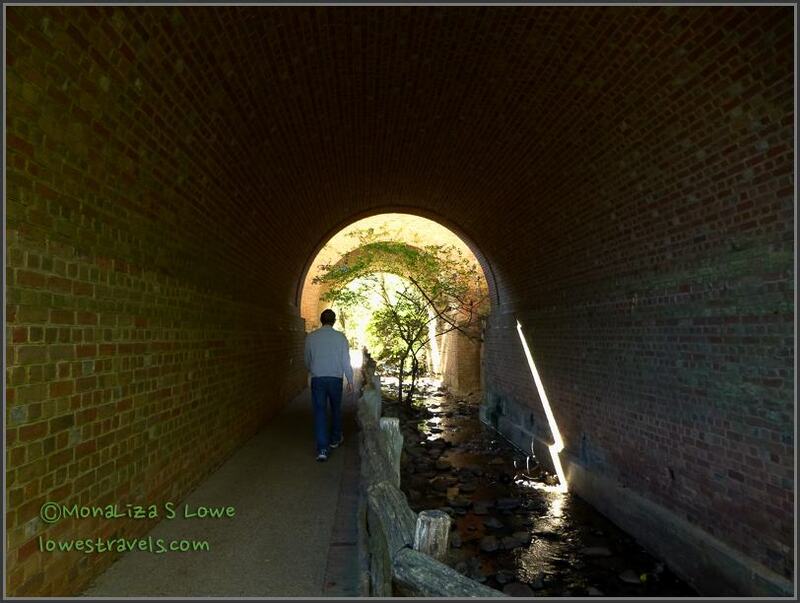 From the visitor center, we followed the path across a footbridge back into 1774, walking under thick double brick bridges and following the trail taking us to the historic town. Colonial Williamsburg is billed as the largest living history museum in Virginia, a restored 18th-century capital of Britain’s largest, wealthiest and most populous outpost of empire in the New World. When you enter the historic town you are brought back into the time when life was simple, yet still under control of the monarchs in Great Britain. Which way to the eighteenth century? Wow, do I look out of place or what? The historic area is 301 acres of restored, reconstructed and refurnished historic buildings. We tried not to compare this with our stop at Louisbourg in Canada, which was also a reconstruction. But Colonial Williamsburg is older by 100 years, and Louisbourg was a fortress, not a colony. 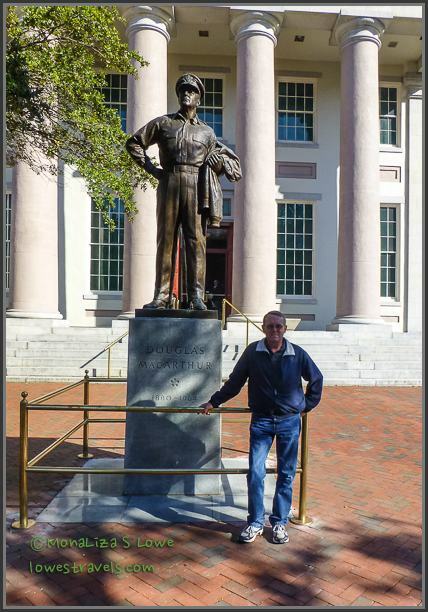 Patrick Henry’s speech – Liberty or Death! 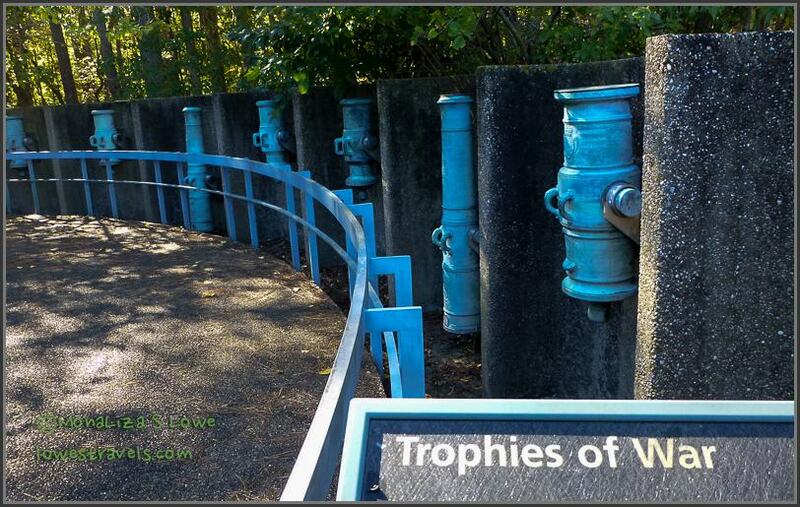 We found the Voorhees Archaearium very interesting, as we perused the many archaeological remains of the old James Fort. Too bad photography was not allowed inside the museum, for there were centuries-old “skeletal remains” that told a fascinating story and have been featured on the History Channel. 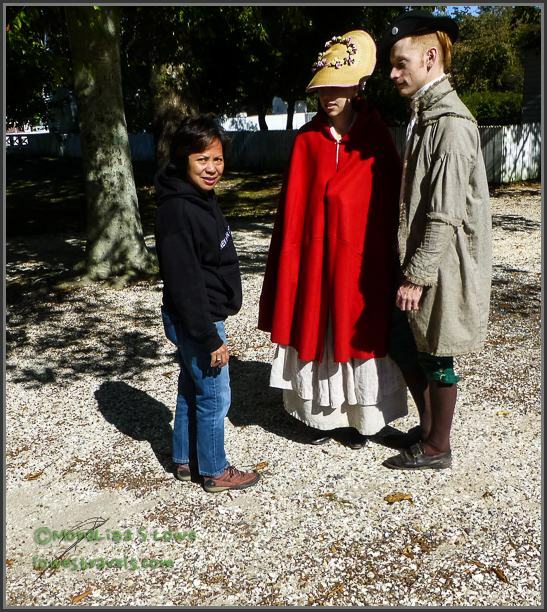 At the Yorktown Battlefield, we learned about the defeat of the British by the joint American and French forces led by Gen. George Washington. After viewing the 16-minute film, we walked behind the British defensive earthworks, then drove the self-guided seven mile battlefield tour. We stopped at the “surrender field”, where some of the spoils of war captured by Allied forces were displayed. 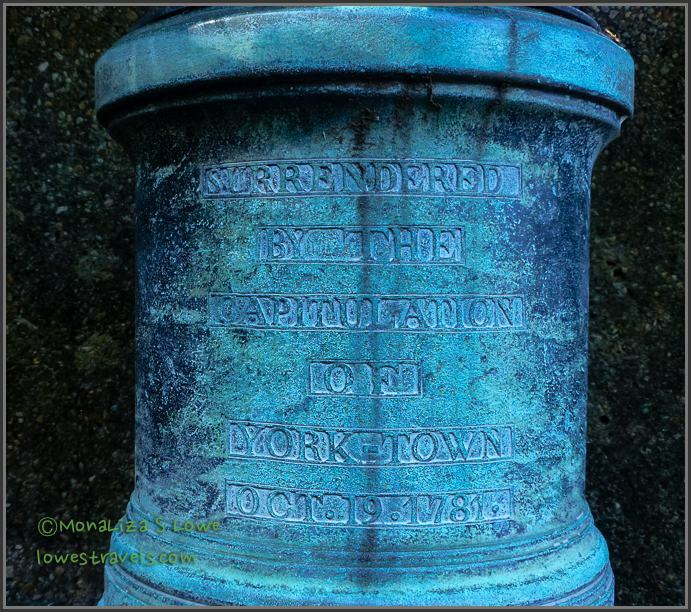 The inscription on each of the mounted trophies of British brass guns, howitzers and mortars read “SURRENDERED BY THE CAPITULATION OF YORKTOWN OCT 19, 1781”. On that date, British troops lay down their weapons following the surrender. 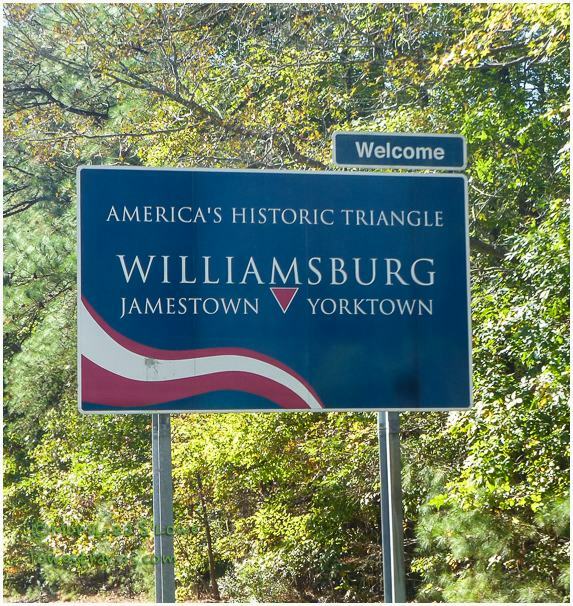 Yorktown is remembered as the place where the British surrendered to General Washington, ending the last major battle of the American Revolutionary War. It also remained in Union control during most of the Civil War. It’s hard to imagine thousands of British soldiers laying down their weapons on this field, as many thousands of Allied soldiers looked on. I haven’t even mentioned just how significant the state of Virginia is, for I’m skipping many details learned during our historical exploration. But if you like history or are a history buff, I’d say visiting here is definitely worth your time. Virginia is where it all began in 1607! About an hour’s drive from Williamsburg is Norfolk, where my childhood friends Kathy and Janice live. 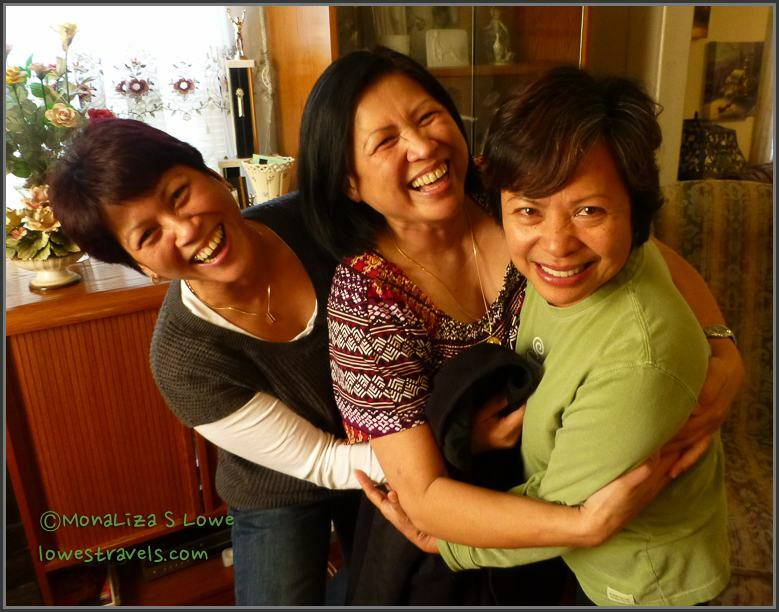 Good food and lots of laughter ensued as we reminisced our childhood days. As the girls were yacking away in our dialect, the boys, Edwin and Steve enjoyed their own exploration. 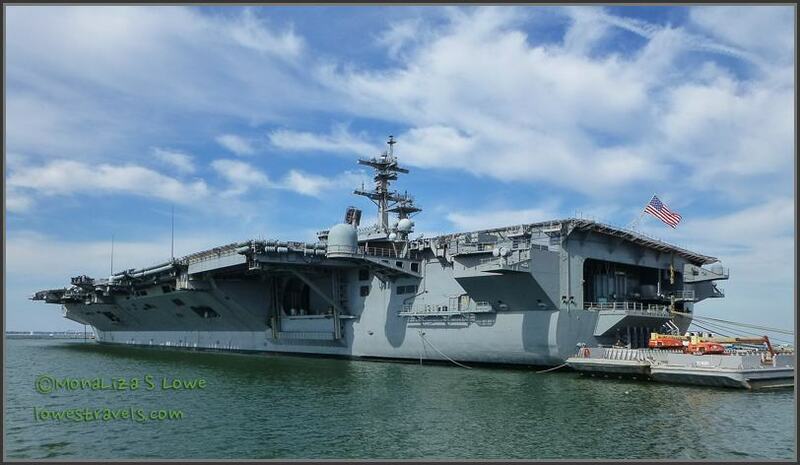 Since Edwin had access to Norfolk Navy Base, Steve was excited to get a personal tour of the docks and other areas. 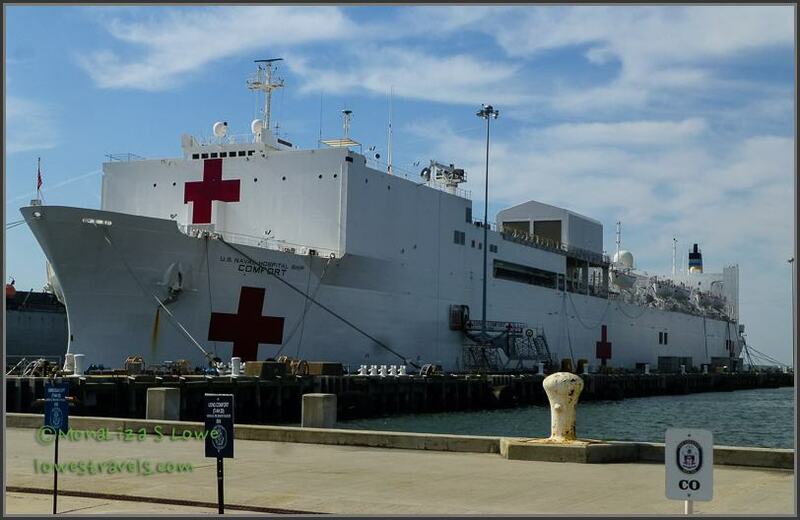 Floating hospital, and there are bigger ones than this! 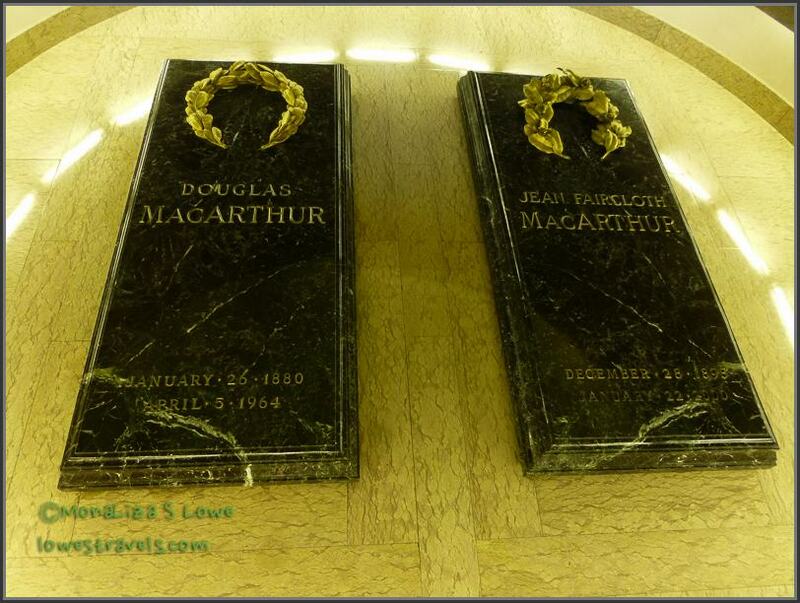 Finally, they made a stop at the excellent Douglas MacArthur Memorial Museum. 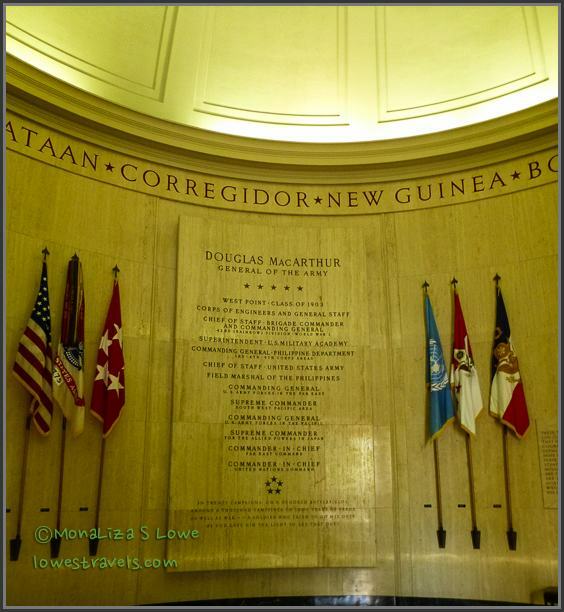 The bodies of MacArthur and his wife were interred here in Norfolk, the home town of the general’s mother. After this final stop in Virginia, we are finally done with our history lessons! Since I did not learn much American history in school, our escapades have been very enlightening and I think it’s sticking in my brain much better than if I had to read about it in books. So, beginning with our next stop, our slow trek to Florida will be along the Atlantic coast – which means lot of beautiful beaches! If the weather holds, that is. Driving through the state of Virginia, we learned quickly that it is not only steeped with history but also rich in natural beauty. This was very evident as we drove north along country roads to our next destination. We were graced with the green lushness of the countryside dotted with wildflowers, the beautiful farms and the small charming towns. Our last stop in Virginia was at Luray in scenic Page County. 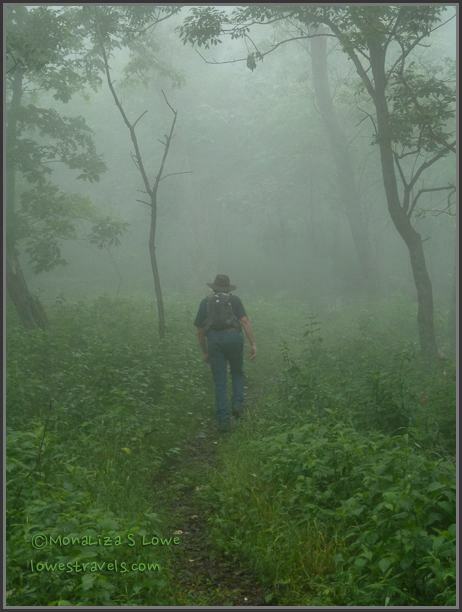 On our first day at Shenandoah National Park we headed south and were met with heavy fog at the higher elevations. We drove slowly, but because we were unfamiliar with the curves of Skyline Drive we turned around as soon as we saw a safe place to do so. We did not intend to leave the park empty-handed; instead we looked for a place where we could wait out the fog. We learned later on that it was at Mile 35 near the Pinnacles Overlook where we made our u-turn. Skyline Drive in Shenandoah National Park follows the crest of the Blue Ridge Mountains for 105 miles. At its southern end it joins the Blue Ridge Parkway, where we were a few days ago. Unlike the Blue Ridge Parkway where most of the scenic overlooks have overgrown trees blocking the view, Skyline Drive has beautiful and plentiful overlooks. 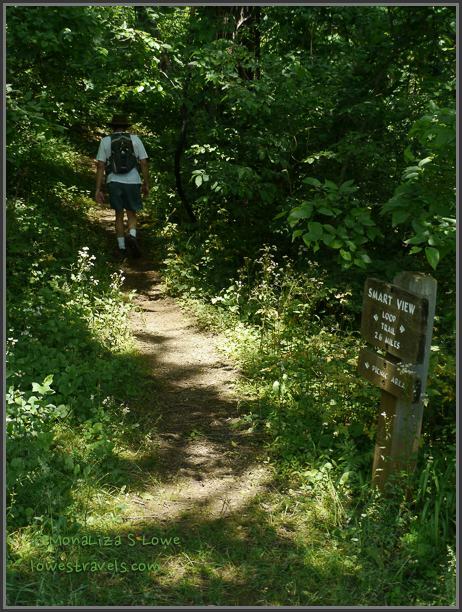 Once we got back below the fog, we stumbled onto a gorgeous hiking trail, Buck Hollow. This is the 3-mile portion of a longer trail, and it’s pretty much a constant descent and rather steep in several sections. We were paralleling the Buck Hollow stream and at some points made a few rock-hops across the water. The constant descent going in let us know we’d get a good workout on the way back. Steve saw a black bear cub, but it smelled him quickly and ran away. This is really bear and deer country. We saw these colorful critters and some mushrooms or fungi. The fog had lifted after our hike , so we continued on to the highest point of the park at the Skyland area. We stopped first at the Stony Man overlook and took a picture of Stony mountain, where we could follow a trail that led to Stony Man Summit. 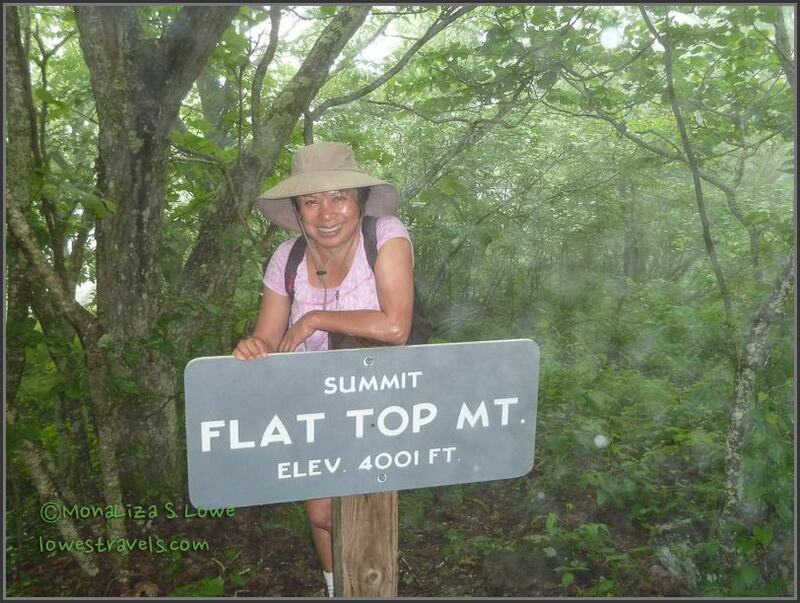 The trail to the summit was an easy 1.6 mile hike, ending with excellent panoramic views. Unfortunately, some patches of fog were still there and partially obscured our view on this day. 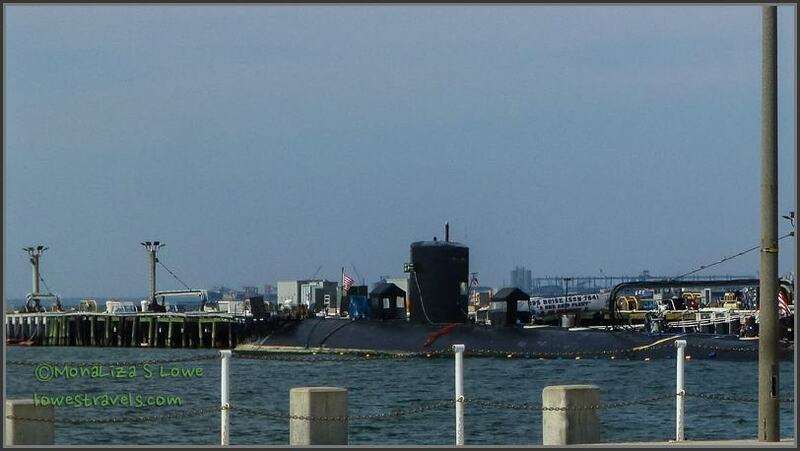 The next day was sunny, and we wanted to make use of our 7-day, $15 entrance fee. This time we headed north and pulled off at many of the over 75 scenic overlooks to see the views. We went almost all the way to the north entrance and stopped at Mile 5, the Dicky Ridge Visitor Center. On this drive we met some of the frequent visitors cruising along Skyline, motorcyclists of all shapes and kinds and colors. It was wonderful to see the wildflowers blooming and wild animals running away from us as we cruised along. …and the other to an interesting rocky outcrop with columnar joints. And along the way we saw more interesting mushrooms or fungi. There are many more hiking trails and miles for us to explore along the Skyline Drive, we’ll just have to come back to experience more of the Shenandoah National Park. Finally during this stop, we took a quick side trip for a tour of the Route 11 brand potato chip factory. We had never heard of the wheat and gluten-free Route 11 brand of chips until Steve stumbled on it while searching for an RV park in Luray. The Mama Zumma’s flavor, packed with Habanero pepper seasoning, set our mouths on fire and had us grabbing for a cold beer. Several flavors of these yummy chips are sold at Whole Foods and other stores. These chips are on fire! 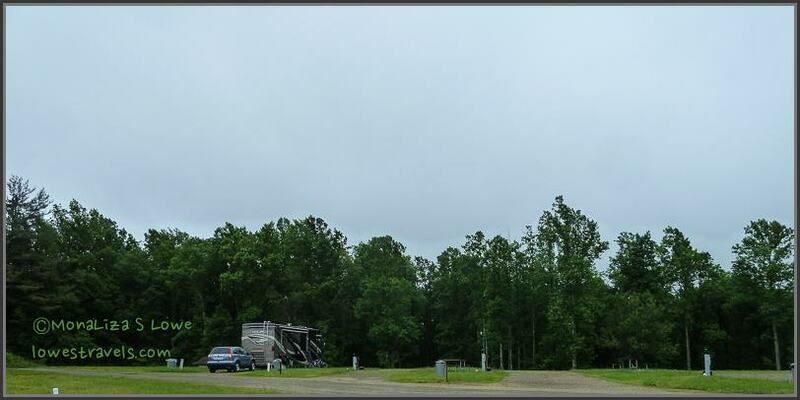 Our base camp was at Outlanders River Camp and we chose it for its proximity to the Shenandoah National Park. We loved it, for we were surrounded by beautiful greenery and all of the nearby mountains. You can see Steve’s review here, if you’re interested. And when the sun came out we enjoyed it to the fullest, with a campfire – even on a hot and humid day. And these lovely duckies were fun to watch! Green bee – see the ant looking at him? We hold these truths to be self-evident, that all men are created equal, that they are endowed by their Creator with certain unalienable Rights, that among these are Life, Liberty and the pursuit of Happiness….an excerpt of the Declaration of Independence by Thomas Jefferson. Drafted by Thomas Jefferson between June 11 and June 28, 1776, the Declaration of Independence is at once the nation’s most cherished symbol of liberty and Jefferson’s most enduring monument. We were reminded of that and learned much more history at Monticello. Monticello, “Little Mountain”, is a remarkable house and one of America’s most famous. This was the home of Thomas Jefferson, the third US President. He designed and redesigned and built and rebuilt his home over a period of more than forty years. The 35-minute house tour allowed us to see the inside areas filled with ingenious devices and mementos of this brainy revered founding father. We were extra attentive, as no photography is allowed on the house tour. Hearing the docent tell stories about this amazing man took us back over 200 years. What struck me the most was the polygraph that he invented and used. It is a copying machine with two pens, where when he writes with one pen, the other made an exact copy – very ingenious! He started his day at 3AM, writing letters for the next fours hours. His eloquence in writing prompted John Adams, the second President of the US, to ask Thomas Jefferson to draft the Declaration of Independence. And of course the issue about his dalliance with Sally Hemings, an enslaved lady’s maid, was asked and confirmed – TJ was the father of her children. The house tour was a little rushed, but if you are a history buff and admire architecture you will love it. We took the time to check out the basement, which used to be the hub of “dependencies”, activities where slaves performed their daily household work unseen and unnoticed by guests. On the grounds we joined the Slavery at Monticello Tour, at the Mulberry Row. Since the structures no longer exist, we listened and imagined the guide’s many stories about activities and life at Mulberry Row. This street was populated by more than 20 dwellings, the center of work and domestic life for dozens of people — free whites, free blacks, indentured servants, and enslaved people. Some of the buildings are due to be rebuilt within the next year or so. Dubbed “Revolutionary Vegetable Garden”, this is where TJ did some farming/agriculture experimentation. 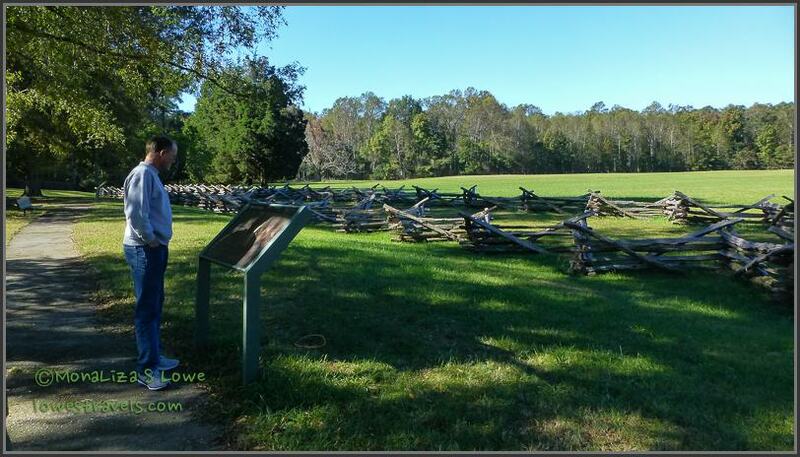 The next day we stumbled onto yet another historical place, the Appomattox Court House National Historical Park. Little did we know that we had just closed the loop on the Confederacy Trail from Montgomery, AL where the first salvo to cecede from the Union began, to Appomattox Court House, VA where the civil war ended and the nation became one again. Parlor where Robert E. Lee surrendered his army to Lt. Gen. Ulysses S. Grant. On April 9, 1865 Robert E. Lee, commanding general of the Army of Northern Virginia, surrendered his men to Ulysses S. Grant, general-in-chief of all United States forces. We walked the old country lane where these events took place and in the solitude imagined the activities of those April days in 1865. But the best part of this stop was visiting my cousins Vellie and Phebe. We visited Phebe and Dan at their home in Lynchburg, VA where they showed us their organic garden and served up a delicious meal. Harry and Vellie Hall gave us a tour of their B&B and Boutique at Diamond Hill Retreat in the city of Charlotte Court house, VA. It was great to see them again! 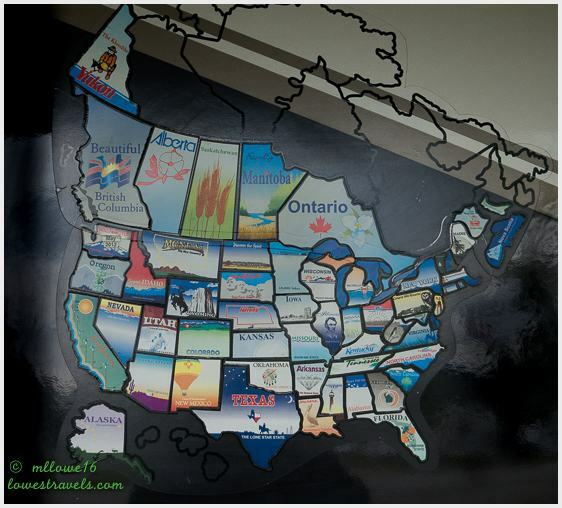 Our three-day stay at Paradise Island RV Park was packed with historical lessons and reconnecting with cousins. 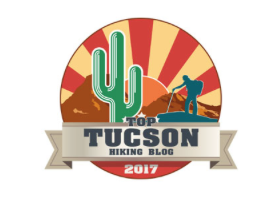 We didn’t like this RV park much, so it was fortunate that we spent very little time here – Steve’s review is here. Upnext: Skyline Drive in Virginia! 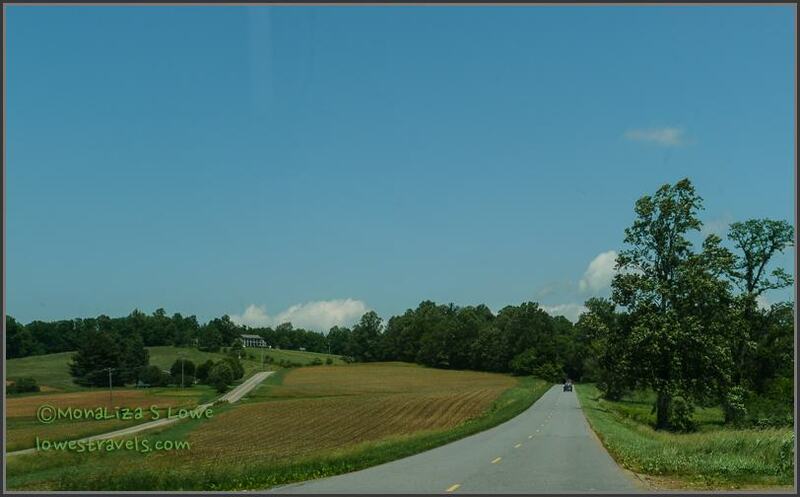 More of the Blue Ridge Parkway – onward through Virginia! We were happy that we made it to Meadows of Dan in Virginia just before the onslaught of pounding rain for the next couple of days. Then, after just one sunny day as a reprieve, along came a severe weather warning. Our park host knocked at the door to make sure we had heard the warning and gotten ourselves ready by 3PM for what was to come. We were fortunate that the brunt of the storm passed to the north and we had only a short but strong storm blow through. Roanoke and points north did not fare so well. When the winds and the rain decided to give us a break we ventured out once more to the Blue Ridge Parkway on the Virginia end, marked “B” on the map below. The “B” covers milepost 154 to milepost 213. We covered the “A” section during our stay in North Carolina, covered in our previous post. There are so many places to pause along the Parkway…and on this stop our base camp was at Meadows of Dan, a small mountain town. 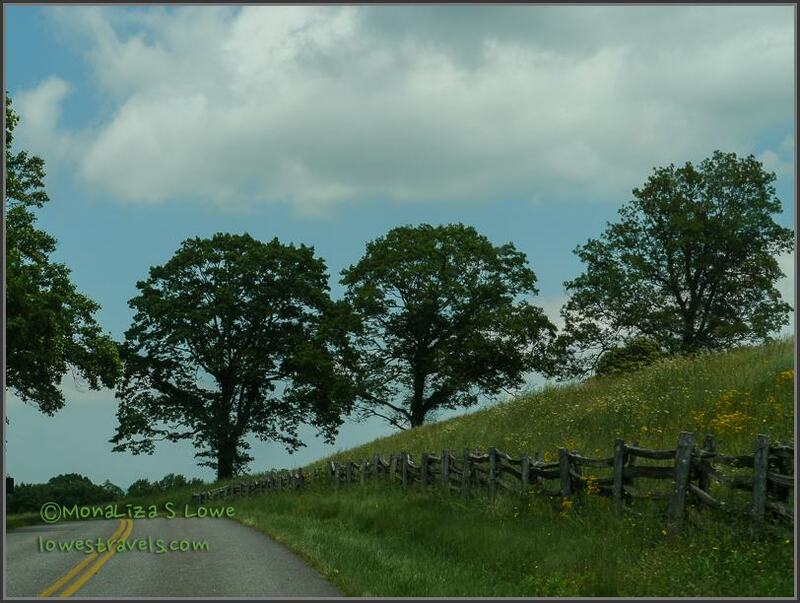 The Blue Ridge Parkway – Americas favorite scenic drive! Driving along the Parkway is not just about the built-in distractions – mountains, clouds, flowers and the curves – but also about the wines, area music and the hiking trails. And so much more! 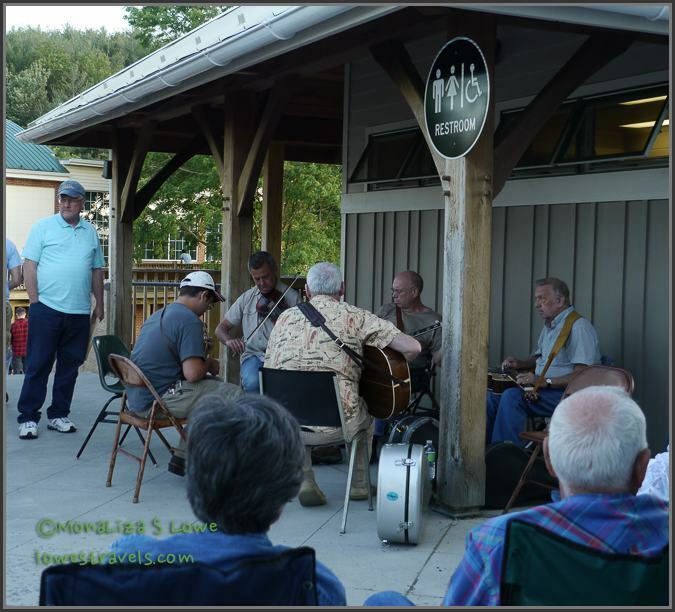 At milepost 213 is the Blue Ridge Music Center, dedicated to continuing and keeping alive some of the richest traditions of mountain music and dance. 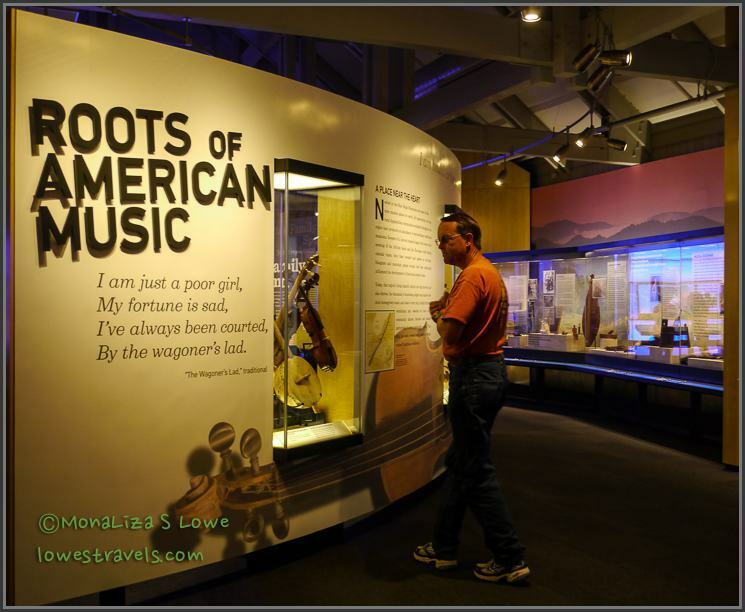 Inside is an interactive exhibit “The Roots of American Music” that tells the compelling story of the region’s rich musical heritage. 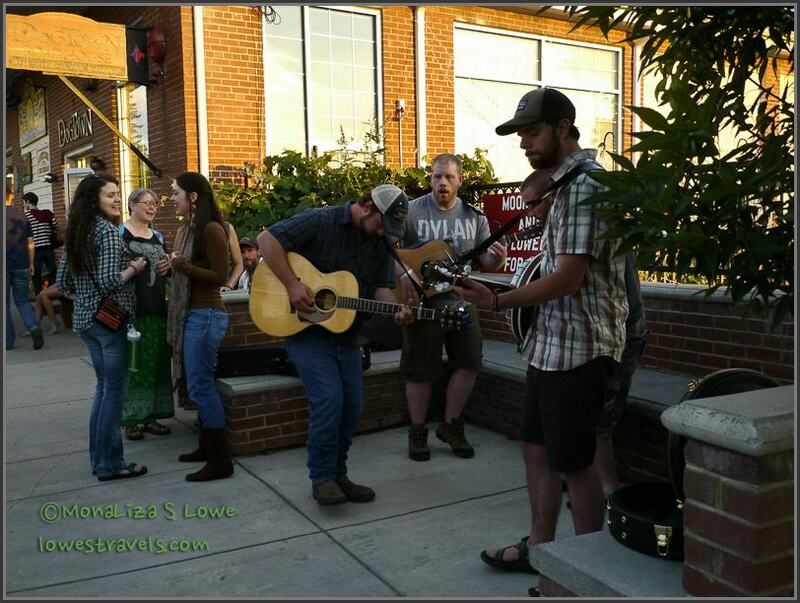 We listened to some old time music, mountain music and bluegrass tunes at one of the hotspots along “The Crooked Road” in Floyd, VA. Here we witnessed young and old alike jamming along the streets, showcasing the area’s musical heritage passed down through generations. 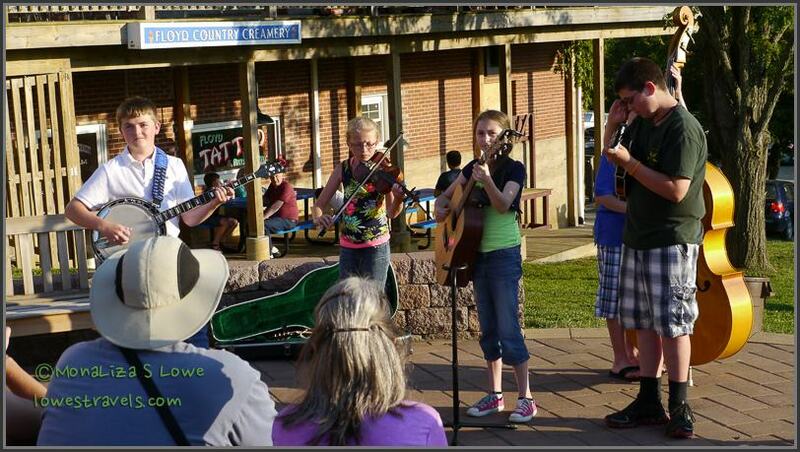 We enjoyed watching and listening to unfamiliar but beautiful music, which is what the locals provide all along Main Street on Friday nights during the summer months. It was a very cool way to spend the evening after a nice dinner at a local winery. This beats elevator music when you’re in the bathroom! We missed the wineries in NC, so we visited two along the Parkway and took the time to taste local Virginia wines. 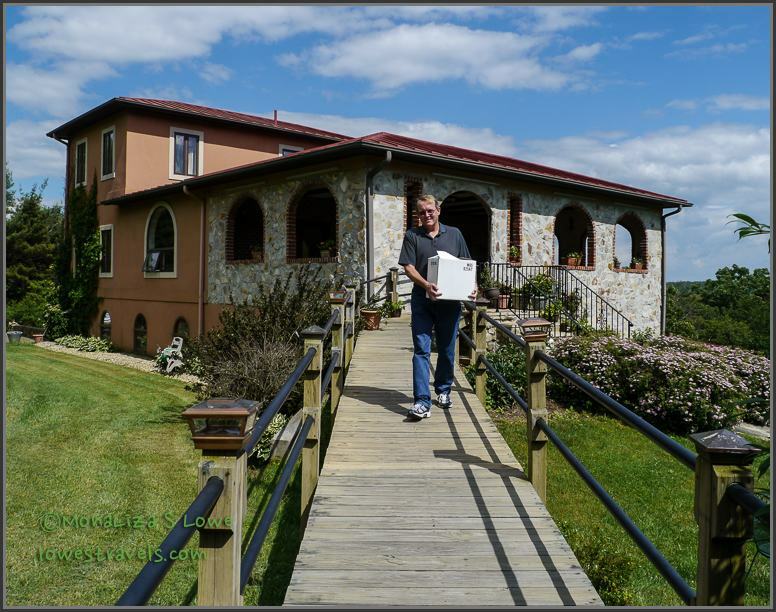 The husband and wife team at Villa Appalaccia Winery and Vineyards specializes in “italian inspired” Virginia wines. We liked their wines so much that Steve came out with a few bottles in a box (gee, that’s never happened before!). Then after a strenuous afternoon of wine tasting we enjoyed a delicious dinner at Chateau Morrisette paired with their yummy Chardonnay. This winery was a bit more commercialized, and we found their wines to be just okay. But wow, what a restaurant! Some of you may know that chocolate is one of my life’s pleasures. 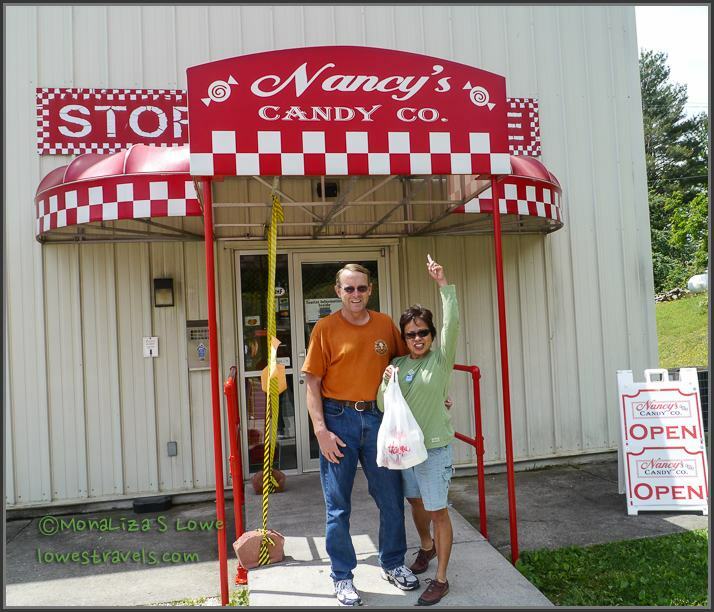 When we stumbled upon Nancy Candy Co., a local candy factory in the small mountain town of Meadows of Dan, I got in and out with my own bundle of sweetness! 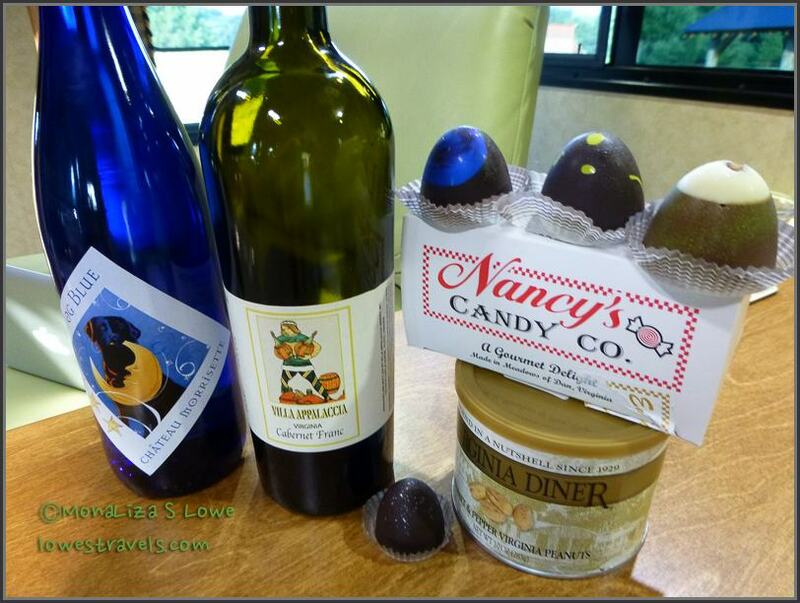 Wine and chocolate – what more can I say? With the abundance of hiking trails along the Parkway, we made sure to hit a couple along our route. While following the Black Ridge/Rock Castle Gorge Trail, we came atop rolling hills and meadows that just forced me to put on the hat of Maria and sing …”The hills are alive …” Steve took cover, but managed to get the photo below as he ran away. We also tackled the Smart View Loop, where Steve saw a young black bear. Unfortunately, it took off like a bullet before we could even aim the camera. Despite a forecast of rain and fog we still trekked onto the Flat Top Trail. This trail makes a fairly steep and constant ascent, and even though it was only about 2 miles one-way, it was one of the most exhausting we have taken. Coupled with fog and a driving rain that started on our way back to the car and soaked us completely, not one of our most comfortable hikes. Hiking in rain and fog, no view today! 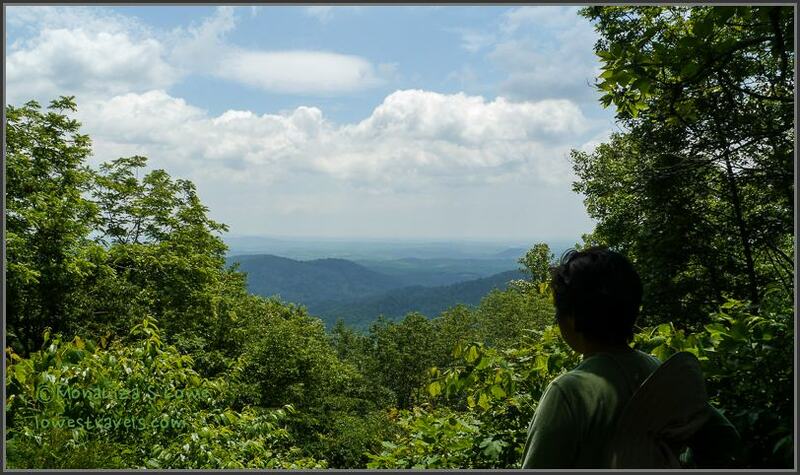 At the Fairy State Park we hit four moderate trails; the Beach trail, Little Mountain Falls trail, Oak Hickory Trail and Stuarts Knob trail that led us to Little Waterfall, a ridge overlook and a beach overlook and very green trail. As you can see, we only explored a sliver of the 469 miles of the Blue Ridge Parkway. 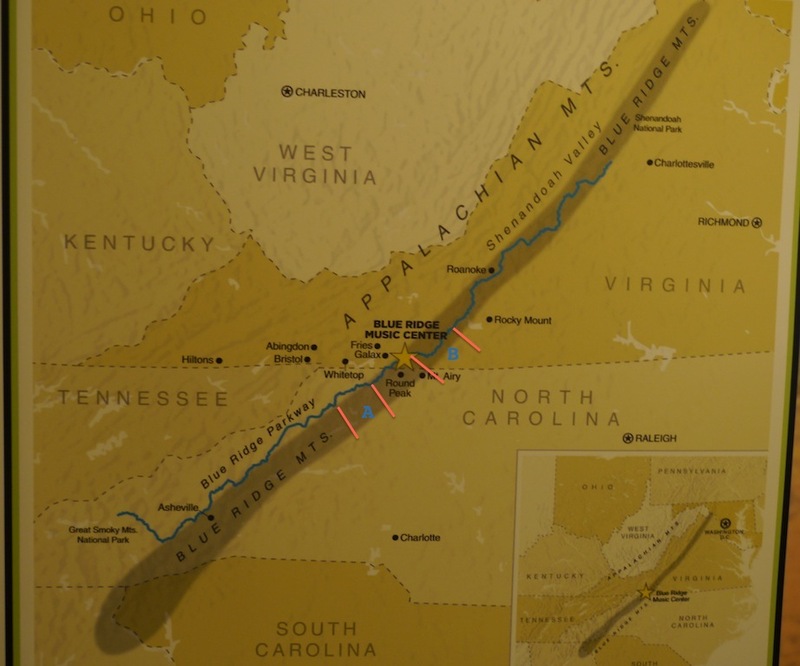 One can make the odyssey while experiencing many worthwhile attractions along the way, beginning at Mile 0 in Virginia and ending at mile 469 at the Great Smoky Mountains National Park in North Carolina. We really liked the Meadows of Dan Campground, for it was quiet and the meadows were sooo green. Click here if you’d like to read Steve’s review. Meadows of Dan Campground, almost all to ourselves! And lastly, a gorgeous sunset over the Blue Ridge Mountains. Next up: A visit to Monticello!